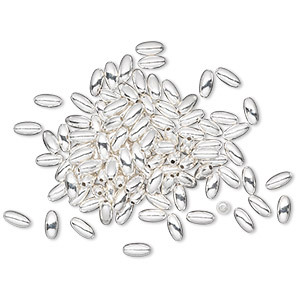 Bead, silver-plated brass, 12x4.5mm smooth oval. Sold per pkg of 100. Item Number: H20-3249MB Have a question about this item? These brass-based beads are well-plated with a shiny finish for dazzling designs. Great for adding texture and intricacy to your beaded creations. Bead, silver-plated brass, 19x5mm smooth oval. Sold per pkg of 100. 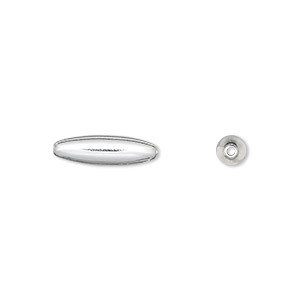 Bead, silver-plated brass, 15x4.5mm smooth oval. Sold per pkg of 100. Bead, silver-plated brass, 5x3mm oval. Sold per pkg of 100. Bead, silver-plated brass, 8x4mm oval. Sold per pkg of 100. 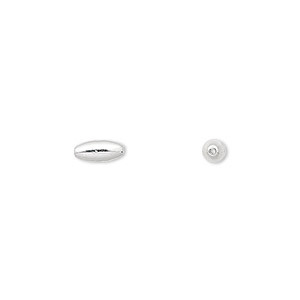 Bead, silver-plated brass, 8x3mm oval. Sold per pkg of 100. 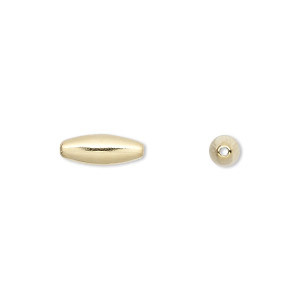 Bead, gold-plated brass, 15x4.5mm smooth oval. Sold per pkg of 100.